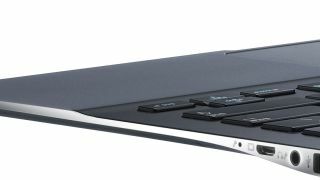 Voice recognition specialist Nuance has announced a version of its Dragon software for Intel-based Ultrabook laptops. The Dragon Assistant Beta will be available for download later this year for owners of the super-slim MacBook Air botherers and will soon come as standard on all Ultrabook computers. During a demonstation at the Intel Developer's Forum on Tuesday, the software was used to send tweets, search for products on shopping sites, find content on YouTube, play music and more. The first Ultrabook to come with Dragon Assistant built-in will be the Dell XPS13 laptop, later this year. The press release from Nuance offers further explanation on the how the software will work. It says: "Dragon Assistant uses Nuance's core Dragon voice technology and innovative natural language understanding capabilities to provide people with an easy and intuitive way to engage and interact with their devices. Simply say "Hello Dragon" to awaken Dragon Assistant, and from there, just speak to search the web for content, information and shopping; access, discover and play music; check and reply to email; and, listen to and update social media statuses. Dragon Assistant also provides direct access to the most popular content providers for content on the web. For instance, people can say "Search YouTube for Justin Bieber." "When finished using Dragon Assistant, simply say "Go to sleep" for the application to stop listening." A full version of the software, which is the first fruit to be yielded from a strategic partnership between Intel and Nuance, is expected in early 2013.